Australia could soon benefit from highly sensitive coloured x-ray imaging and powerful new tools to reveal the structure of materials in unprecedented detail and provide major advances in medicine and technology. Together with a linear collider that will help unlock the mechanisms of how the universe was formed, this is the aim of a new collaboration announced in July 2010 by The Hon. Kim Carr, Minister for Innovation, Industry, Science and Research. The Australian Collaboration for Accelerator Science (ACAS) will unite some of Australia’s brightest research talents in physics and help train a new generation of young Australians to continue our contribution to this critical area of research. As accelerator science underpins the development of new materials and processes in nanotechnology, environmental science and medicine amongst many others, this collaboration will help keep Australia at the forefront of science and innovation well into the future. ACAS will bring together the Australian Synchrotron, the University of Melbourne, The Australian National University (ANU) and the Australian Nuclear Science Technology Organisation (ANSTO). Front row L-R: Harris Panopoulos, Stefanie Elbracht, Vivien Lee, Tessa Charles, David Peake. 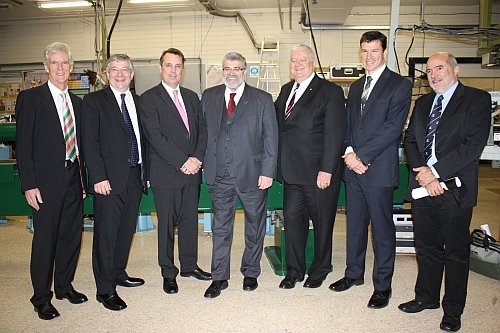 Back row L-R: Paul Bennetto, Bryn Sobott, Kent Wootton, Senator The Hon Kim Carr, Prof John Dewar (University of Melbourne Acting VC), Andrew Cole.